In 1990, the skeleton of a battle-scarred Tyrannosaurus rex matriarch was found, virtually complete, in what many call the most spectacular dinosaur fossil discovery to date. 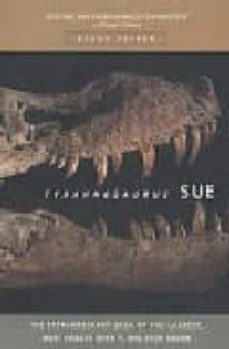 Not just another dinosaur book, Tyrannosaurus Sue is a fascinating introduction to the centuries-old history of commercial fossil hunting, a legal thriller and a provocative look at academic versus commercial science and the chase for the money that fuels both. - Steve Fiffer, an attorney who has followed the story for the past seven years, has captured the whole range of characters and issues embroiled in the fight for Sue. Fiffer communicates both the excitement over Sue's discovery and the motivations, manoeuvrings, and absurdities of the various forces attempting to control her destiny.